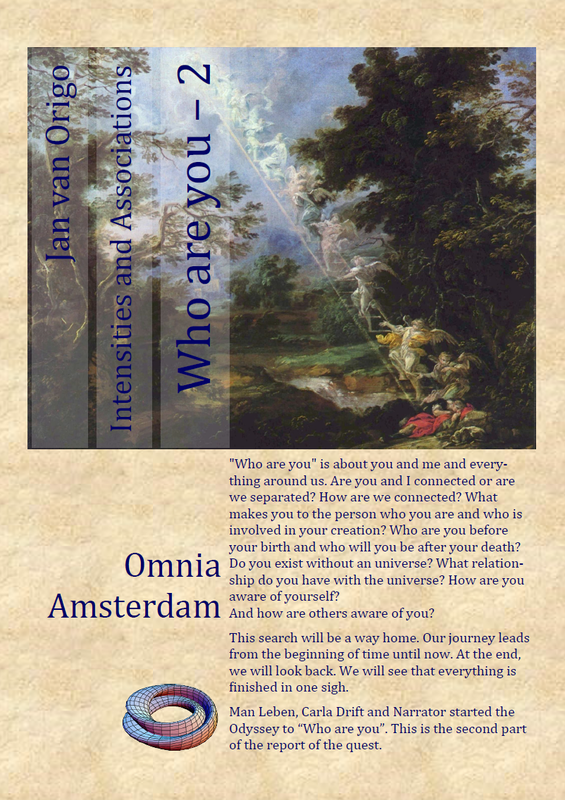 New outline for cover of “Who are you – 2: Intensities and associations” by Jan van Origo ready. This new book will be published within a few weeks. 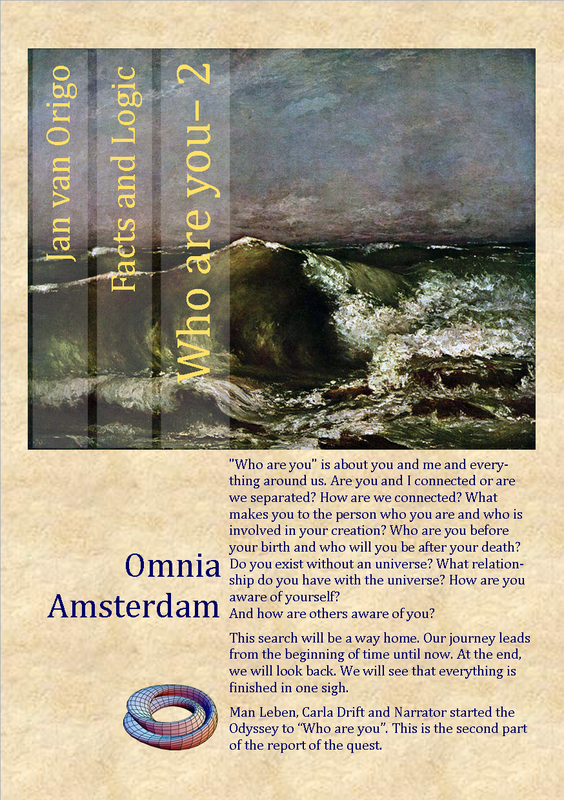 This entry was posted in General and tagged Book, Intensities and associations, Jan van Origo, Who are you on 7 September 2014 by Jan van Origo. The second part of the quest for “Who are you” is about everyday life as we experience it. Five known realities – facts and logic, intensities and associations, emptiness, change and interconnectedness – will be visited. The manuscript of “facts and logic” is ready; it will soon be published in book form. 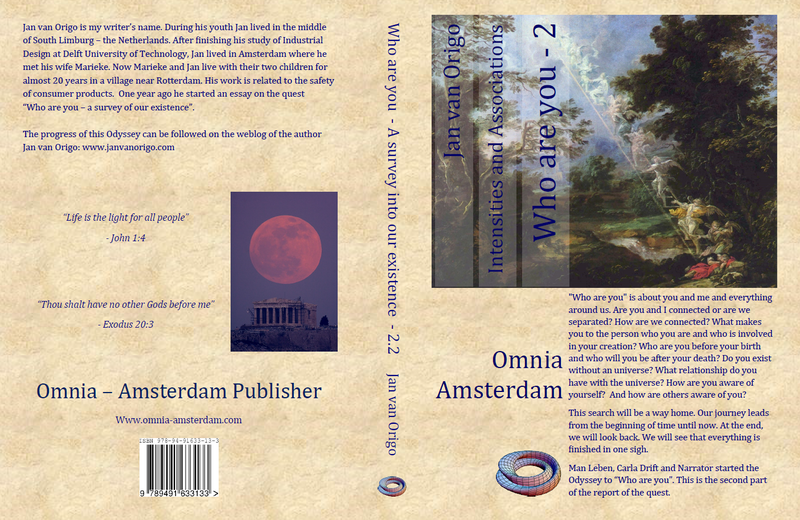 This part of the Odyssey to “Who are you” is set during a holiday visit to Florence, where the three main characters look at the transition from the Scholasticism via the Renaissance to the Reformation during sightseeing. In between, they discuss the possibilities and limitations of facts and logic in science, in life and death and in the way people try to create and maintain their place in the Sun. This entry was posted in Five, Five - Change, General and tagged Florence, manuscript, Odyssey, quest, Reformation, Renaissance, Scholasticism on 3 December 2013 by Jan van Origo. Narrator told me the story of his life told in several parts. In his narratives facts, fiction and faction are intertwined, as in everyday life the separation of the air and earth is artificial . During the narration of the prelude to his life I understood that Narrator’s stories are focused on an universal truth that precedes and goes beyond our existence. This truth is based upon a rhythm wherefrom we originate. This rhythm is rolling through his life in various interwoven cycles. The first cycle in his life story consists of the four incarnations that Narrator mentioned as interpretation for his life. These four incarnations in the life of the Narrator reminded me of the four seasons . The second cycle in Narrator’s life is the rhythm of vanity, action and consequences . The third cycle is the Northern cycle in which Narrator is incentive and spiritual charioteer for enlightenment and home coming of his American beloved. The fourth cycle is the rhythm of trust and betrayal in Narrator’s life together with Raven and Fox in the mirror world inhabited by the secret services of many countries . And always the cycle of the Moon and the starry sky is the steadfast mate in Narrator’s life. I leave the search for the other cycles in the life of the Narrator to the reader. It is an honour and a joy to be with Narrator and Carla Drift on the search of “Who are you”. 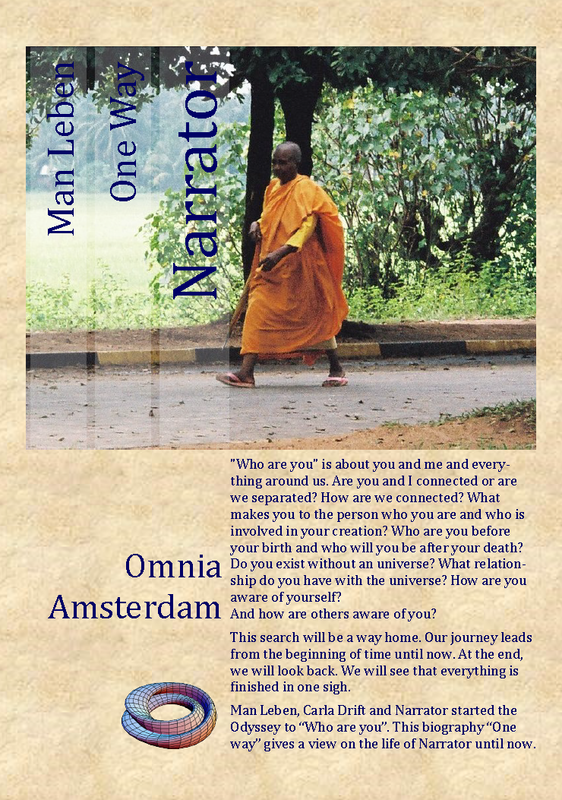 On this Odyssey, Narrator is my beacon and spiritual charioteer, for example at my study Sanskrit – the language of the Gods in the world of men –, when studying Buddhist texts and when reading the works of Rumi. 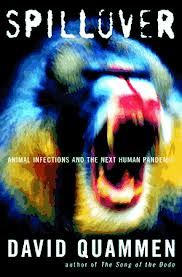 See also: Quammen, David, Spillover: Animal Infections and the Next Human Pandemic. New York: W. W. Norton & Company, 2012, p. 219 – 234. In this popular scientific book a study is made on the interaction and life game – sometimes with far fetching consequences – between higher and lower organisms. During this interaction and life game the division between earth and air is artificial; for example in the description of Q-fever that moved by the wind in Noord Brabant in the Netherlands. 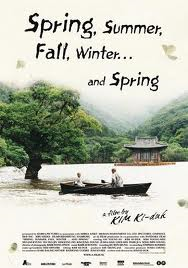 See also: The film “Spring, Summer, Fall, Winter … and Spring” directed by: Kim Ki-Duk. This film gives possibly an interpretation to the crimes by Narrator as child soldier in Africa. The youngster in the film committed several crimes as child in naivety, and as adolescent in a zest for life whereby he must endure the consequences during the rest of his life. See also: The film “Why has Bodhi-Dharma left to the East?” by: Bae Yong-Kyun. This film provides insight into this cycle of vanity, action and consequences, perhaps because a boy inflicts – in an idle urge – a fatal wound to one bird of bird couple. In vain the boy tries to keep the bird alive. The living bird of the couple continues to haunt the boy and gives him a first insight in the fleeting nature of life and death, interconnectedness, passions, sin and fear. See also: Le Carré, John, The Quest for Karla. New York: Knopf, 1982; and see also: Deighton, Len, The Bernie Samson series. published between 1983 and 1996. This entry was posted in About, General, Introduction and tagged action, Bae Yong-Kyun, betrayal, biography, consequences, cycle, David Quammen, faction, facts, fiction, incarnation, John Le Carré, Kim Ki-Duk, Len Deighton, Moon, narrator, rhythm, starry sky, trust, vanity, Who are you on 31 March 2013 by Jan van Origo. As long as I exist, there have been storytellers in my life. At home, at school, in the synagogue, in the Church, in books, in the classics of antiquity, in the Tanakh – the Bible of Judaism – and in the Talmud, I have heard of the experiences of the great storytellers. Next to my mother, the most influential storytellers in my life are: Jesus of Nazareth as the Christ in the New Testament of the Christian Bible, Siddhartha Gautama as Buddha, Muhammad as the Prophet and Messenger of God in the Islamic faith, Vyasa as writer of the Mahābhārata – the story of India –, Homer the poet and singer of the Iliad and the Odyssey, and Rumi or better Jalāl al-Dīn the poet of amongst others Masnavi. Before I met Narrator in Istanbul, an extraordinary mathematician was the most wondrous storyteller in my life. With only a suitcase, he travelled from friend to friend for a few days home. Regularly he stayed a few nights with me in Amsterdam. He recounted about the difference between finiteness and infinity, about prime numbers, sets and zero. As a welcome gift he always gave me some of his mathematics books that he exchanged against a few technical books from my bookshelf. At our parting he asked sincerely if I didn’t mind that he had to leave now. 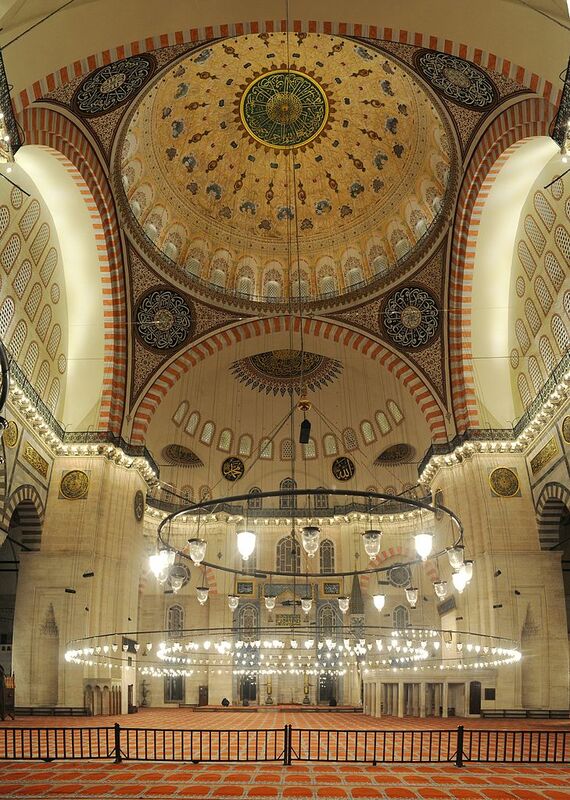 Narrator, I saw for the first time in the Süleyman mosque in Istanbul where he welcomed me with: “Here, air and earth are one”. I replied: “This, that we are now”, whereby he swirled with rustling clothes. That morning I had arrived in Istanbul on invitation by Carla Drift to start our Odyssey to “Who are you – a survey into our existence”. For the first time Carla Drift and I had met at a philosophy lecture given by Prof. Dr. W. Luijpen at the Technical University in Delft. Hereafter our lives regularly crossed; we helped each other where necessary and we always enjoyed each other’s company. A few years ago, Carla began her nomadic existence in Europe with a Caravan-Tractor combination. On a clear icy cold night Carla saw a dark cold man in a sleeping bag by the side of the road. After she had saved him from an eternal dream, they travelled to Istanbul where had scheduled to start our Odyssey. 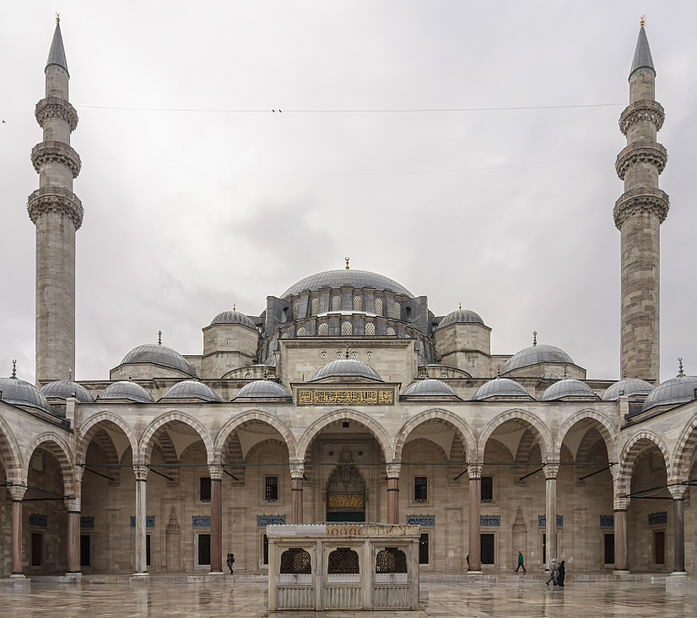 This entry was posted in About, General, Introduction and tagged Inoue Shirō, Istanbul, Jalāl al-Dīn, narrator, Odyssey, Rumi, staryteller, Suleyman Mosque, Tanakh on 29 March 2013 by Jan van Origo.